A special Kelownan delegation from Jonas's home planet arrives at the SGC hoping to reopen trade negotiations. The planet's two other superpowers are about to sign a non-aggression pact, placing Kelowna in a vulnerable position. The Kelownans seek military technology from Earth, and offer valuable naquadria in exchange. Without Earth's help, Kelowna will be forced to use its naquadria bomb in a preemptive strike against its neighbors. The Kelownan delegation includes Dr. Kieran, Jonas's former teacher and mentor, who returns later to speak with Jonas alone. He is part of a resistance movement preparing a coup that will bring peace to his planet. SG-1 travels to Kelowna to begin negotiations for non-military aide, but the Kelownans demand only military assistance. The Kelownan First Minister approaches Jonas, offering him a full pardon to return home to his position with Dr. Kieran, whose behavior has become increasingly more erratic. However, Jonas believes he can do more good by remaining with SG-1, and together they quietly pursue the Resistance, which Dr. Kieran promises has stored naquadria that they are willing to share. Dr. Kieran intends to meet with Resistance leaders, but he is apparently ambushed by Kelownan guards and badly injured in a fall from a building. The Kelownans insist that Dr. Kieran was not attacked, and when he is returned to the SGC for treatment, Dr. Fraiser discovers that he is suffering from advanced schizophrenia, a result of his years of exposure to the unstable naquadria. SG-1 searches for the Resistance headquarters by tracing the hidden naquadria, but in a deserted building they find that although the naquadria is real, the Resistance existed entirely in Dr. Kieran's delusional mind. SG-1 returns home with the naquadria, as Dr. Kieran is given the care he needs on Earth, and his troubled home planet faces its bleak future alone. Dr. Kieran, Tomis Leed, and Dr. Silas were the three original members of the naquadria project on Kelowna. Dr. Kieran was a professor and researcher at the Academy of Science, and one of Jonas’s teachers at university. He recruited Jonas into the naquadria project, and they had been working together side by side for the last six years before Jonas left. For several years an uneasy peace has resulted from the rivalry among the three major powers on P2S-4C3: Kelowna, Tirania, and the Andari Federation. The roots of the conflict go back generations, the last conflict ending 20 years ago with no resolution. When the Tiranians and Andaris signed a non-aggression pact, Kelowna became vulnerable, believing its only defense against complete annihilation was a preemptive first strike with a naquadria bomb. Archaeologists had discovered a series of mine shafts beneath the original site where naquadria was first discovered, and had been able to extract and process a considerable amount, roughly equivalent to 300 pounds. Dr. Kieran is suffering from a unique form of brain damage resulting from long-term exposure to naquadria radiation and improper shielding while working on the bomb project. Symptoms include paranoia, delusions, and hallucinations. Proper medication can reduce further deterioration. 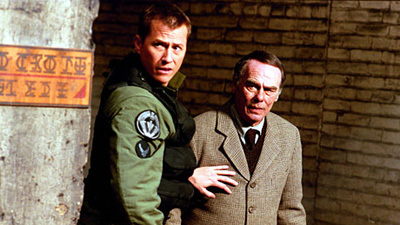 SG-1 found the naquadria Dr. Kieran had smuggled into a warehouse, and brought it back for further research on Earth. There has been no response from Kelowna since SG-1’s return, and the planet may be at war. Jonas carries and fires an in’tar handgun.